"You don't know until you try. For one thing..."
"―I know I wouldn't become your enemy. Ever. No matter what happens, even if I'm killed, I would be on your side." It was his will, and it was unwavering. In order to know, you had to try it first. He believed that human souls, when faced with a dilemma, would ultimately choose peace over war, songs and scriptures over weapons, and love over hatred. It wasn't a fantasy. It was hope. I still haven't abandoned hope. I want to find a road that you can't see, and point it out for you. Nezumi averted his gaze. He kicked the chair leg with the tip of his shoe. "It pisses the hell out of me sometimes, when I'm with you. Your head's full of naive and idealistic theories, and you talk as if you're actually serious about them." "You wouldn't listen if I wasn't serious about it." "That's enough," said Nezumi curtly. "Just shut up." He began working at setting upright the chair that he had kicked over, and lightly thumped the faded cushion seat. "An idealistic armchair theorist like you should just sit here all day long. Ignore the world outside, and mull over this and that all inside your head. Don't talk to me anymore. Don't make me any angrier than this." "I don't want to hear it. Listening to you makes me sick. Sick and tired. Damnit, if I knew you were such a chatterbox, I would never have brought you here in the first place." "I'm not a chatterbox. I actually don't like speaking to people much." "Then all the more reason for you to shut up." But I can't just shut up. I can't sit here, close myself off in my own world and sever myself from the world outside. I have to talk to you, listen to your story, and search for a way that we can go on living together. I don't want to live like this anymore― plugging my ears, keeping my mouth shut, closing my eyes. Nezumi, you were the one that made me feel that way. Pry your hands away from your ears, you said, open your mouth, and will your eyes to see. Those were your words. And now you're telling me to shut up? You're telling me you don't want to hear it? "Who's the coward now?" He muttered out loud without thinking. Nezumi's expression hardened. Is this gonna end in a fight? The thought flitted in a corner of his mind. Then he decided he wouldn't mind if it did. Nezumi would probably easily wrestle him to the ground. Four years ago, and even now, this hadn't changed. Shion had no chance against him. But it wasn't about winning or losing. He wanted to charge at Nezumi with his own body, his own flesh. He wouldn't mind if he were to be pushed to the ground, punched, or pinned so that he couldn't breathe. If even for a moment, he wanted to collide with Nezumi as equals. But Nezumi averted his gaze again. He made for the door without even looking at Shion. But before Nezumi's hand closed around the doorknob, there came a muffled scratching sound from outside. Something was tearing at the door. A moment later, there was a bark. Nezumi and Shion looked at each other. Nezumi opened the door. A large, dark brown dog was sitting in the doorway, wagging its tail. It had a white parcel in its mouth. "You're from Inukashi's―something happen to him?" Nezumi retrieved the package from the dog's mouth. It was a letter. Nezumi read it, and the corners of his mouth relaxed. "Shion, there's a job request for you." Shion ran his eyes through the letter that was passed to him. It was nearly illegible. The paper itself was yellowed, old, and wet with dog saliva, and the handwriting meandered all over the place. But it thrilled Shion's heart more than any other letter he had received. "It's just how it reads. You wash dogs― the ones that Inukashi lends out for heating. They're the big, quiet ones with long fur. There must be about twenty of them altogether. He gets customers sometimes that don't pay because they complain the dogs are smelly or have fleas, so once a week on a sunny day he takes them out for a wash. So what are you gonna do?" "I'll go, of course," Shion glowed. "He's asking me if I want to come work. It's my first job. I actually have a job now." "Will you stop gushing?" Nezumi said with a grimace. "Man, you really are easy to please, aren't you?" "Nezumi, should I take anything with me? Do you think I'll need soap?" "You probably won't need anything. Just beware of men and women who might pull you into alleyways, I guess. If that dog is with you, I don't think you need to worry. I'll go with you partway." "Speaking of which, I do want to see your workplace one day. And see you on the stage." "Thank you," Shion told him. "Thanks to you, I've been able to get my hands on my first job. I'm all yours, take me there." The dog wagged its tail as Shion crouched down toward it, and licked him under the chin. "You're licking my wound for me? You're a nice boy." "Dumbass, he only licked it because he smelled blood." "I don't think so. He did it because he was concerned about me. But whatever the reason, he's certainly nicer than you," Shion said wryly. "Don't compare me with a mutt," Nezumi said sullenly. He looked genuinely disgruntled. The way he stuck his lip out brought back a fleeting image of his face four years ago. It somehow made Shion want to laugh, and for some reason, made him feel nostalgic. "What?" Nezumi said. "What're you grinning about?" "Nothing," Shion said mildly. "Just noticing you've still got a childish part left in you. It made me kind of happy." "Never mind. Alright, then," he said briskly, "lead the way." He petted the dog lightly on the back. Picking up the cue, the dog bounded up the stairs. Shion followed after it and exited the basement room. The sun was bright in his eyes. 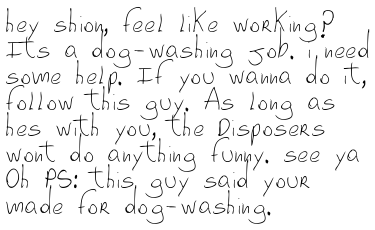 I see― a day like this would be perfect for washing dogs. He tilted his face up to the sky and breathed in deeply. It looked like Shion's figure was being sucked into the light. Whenever Nezumi crawled out of his dark hole, the light always stabbed at his eyes. He didn't like bright places. Places filled with light always turned easily into areas of danger. He knew this well from experience. He couldn't be like Shion and fully accept the light without hesitation. Friends and enemies. Outside the wall, and inside the wall. Love and hatred. Light and dark. I told you, didn't I? They can never co-exist. I've told you so many times, and you still don't seem to get it. He swallowed a sigh that was halfway up his throat. The lump sank deep down into his chest again. As Nezumi was about to lock the door, a mouse came rubbing itself against his foot. "You're back." He scooped it up in his hand. The mouse seemed exhausted. Its grape-coloured eyes were bleary. "You've worked hard. Rest up." The mouse shook its head, and spat a capsule onto Nezumi's palm. There was a light blue piece of paper inside. "A reply, huh." If it was, Shion would rejoice. Today must be a lucky day for letters. Just for an instant, a blackness flitted across his heart. A black thing. It had no form― it was only dark. Uncertainty, a bad premonition. A dull pain throbbed in the back of his head. He opened the capsule. The paper was scribbled with what looked like Karan's handwriting. The pain got worse. Nezumi screwed his eyes shut, and leaned heavily against the door. Either way, if that girl is the second sacrifice, she hasn't been taken to the Security Bureau. She's headed for the Correctional Facility. A mouse takes half a day to get back from No. 6. There's no more time. She's probably been imprisoned in the Correctional Facility already. Why were they eliminating so easily a Gifted Curriculum student that they had measured, carefully selected, and spent considerable funds and time to raise? Why? Why― what was going on? What are they hiding? What's about to happen? Nezumi slowly brought himself upright. He didn't know. It was a mystery. But now was not the time to be solving puzzles. He had an important decision to make. If he showed this scribbled note to Shion, he would probably head right for the Correctional Facility, without even knowing what kind of place it was. He would go, with the single intention of rescuing Safu. A sheltered simpleton of a little boy like him would never be able to let a friend's death go unheeded. If he could prevent it, it was reason enough for him to go diving head-first into a nest of venomous snakes. He would willingly embark to his own death. Or do I crush it? It was very easy to do. This girl, Safu, had nothing to do with Nezumi. She was a stranger. It wasn't any of his business what should happen to her. He could leave things be, and it wouldn't matter. Nothing would change. But if Shion died, something within him would change greatly. He didn't want to see Shion die. He would probably suffer. Not Shion, but he― Nezumi― would suffer, from having to live and stand before Shion's corpse. He would be experiencing the same suffering again, of being broiled alive in hellfire. You've gotta be kidding me. I've had enough of this already. He didn't want to lose him. He didn't want to experience the remorse of having been the one that lived. I don't want to lose him? I would suffer? He was clicking his tongue in frustration. So this was what he had come to. He almost felt like curling up on the ground. He had rescued Shion from the hands of the Security Bureau to return the debt that he owed him. That was it. He never wished to be attached to him. Shion wasn't the only one― he had never wished to be attached or to share his heart with any other person. Feelings for others were even more dangerous than the light. He was not to share a connection with anyone. Whether it be with a man or a woman, he was only to develop relationships that could be severed easily. Never open your heart to anyone. Don't believe in anyone but yourself. The last words of the old woman. He was turning against them again. I don't want to lose him. I would suffer. Nezumi carefully folded Karan's memo again and stuffed it inside the capsule. He was used to loss, he was used to suffering. Wasn't he? Even if Shion did die, perhaps he wouldn't moan in agony over his gaping loss. Even if he did, perhaps it would only be for a short while. He would be able to use his bed and shower freely. He wouldn't have to worry about making enough soup. He wouldn't be pelted incessantly with questions, or be spoken to. He would be released from having to look up halfway through a book to lend an ear to the other's words, and to give an answer while trying to restrain his irritation. He would go back to his normal life. That was it. He should just pass the memo, capsule and all, to Shion, and then turn his back on him. On a whim, Nezumi opened his door again. Before him was his room, filled with books and sparse furniture. The basement chamber, surrounded by thick walls, was a nest that suited a rat like him well. The room looked barren and dark, and larger than usual. Its coldness, darkness and vacant space seeped into his bones. That was what being attached to someone meant. He would no longer be able to live alone anymore. It was one of many artfully-set traps that lurked at every corner of his life. And to this one, he had fallen victim. Have I still got a chance? "Nezumi, what's wrong?" Shion called from the top of the stairs, the entrance that led to ground-level. "The dog's pulling at me. Hurry and come on up." His shadowy figure floated up against the glare of noon. Have I still got a chance? Shion, will I still be able to live without you? After some amount of suffering, would I be able to detach myself from the trap you've become? Would I be able to sever you? "Nezumi?" The voice from above dropped apprehensively. "Nothing― I'm coming." He closed the door. He heard the dog bark. There was light. The rustle of a breeze. Nezumi wrapped the superfibre cloth around his neck again, and ascended the stairs step by step. He kept ascending to the ground above. Read Volume 3 Chapter 1. Font credit to JOEBOB Graphics for Joe Hand 2 (Karan).